A hectic and happy week of 5 medals this week: 3 silver, one bronze and one Distinction. Ochoa Rosado de Lagrima vintage 2017 has won a Silver Medal in the Mondial du Rosé d´Argent in Cannes. The Mondial du Rosé is known as one of the most popular International contest specialized in rose wines. This year it celebrated its 15th edition and there have been more than one thousand wines from more than 20 countries. Bodegas Ochoa could not miss this opportunity. “Our Ochoa Rosado de Lagrima is a beloved Wine in our house during its winemaking and it represents our region and land very well. It is a wine that has it all!! Beautiful Barbie color, wonderful aromas and a dry and medium palate. And very often it gives us very happy news, like this one” says Beatriz Ochoa, current GM of the winery. 6th generation of the family. Another award received this week in Ochoa is for Gran Reserva 2009 with a Silver Medal in the Concours Mondial de Bruxelles. This contest celebrated its 25 edition in Beijing (China) where a professional judge panel gave a silver medal to Ochoa Gran Reserva 2009, among other 9.000 wines. In Spain, Ochoa Calendas Blanco 2017 received a Silver Medal in the contest BACO, where they award Young wines, only vintage 2017 this year. It celebrated its 32nd edition in Madrid. The judging panel is the Union Española de Catadores. This White Wine made of an original blend of Viura Chardonnay and Muscat, , is not only selected by consumers, but also by the judging panel. 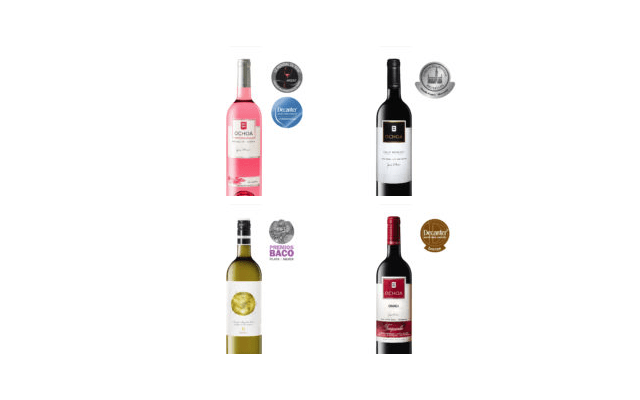 And last but not least the International contest and magazine DECANTER has awarded the following wines: Ochoa Crianza Tempranillo 2014 with 88 points, a Bronze medal, and Ochoa Rosado de Lagrima 2017 with 85 points, a Commended medal, recognizing its excellent quality. As Beatriz Ochoa says “ our agenda is very tight attending to these awards, but we are very happy to continue working to improve even more and get the agenda fuller next year too”.